Dozens of people marched on National Aboriginal Veterans Day from Main and Hastings to the Victory Square war memorial, where people laid wreaths. The annual memorial day is meant to acknowledge the particular sacrifices made by thousands of Indigenous Canadian veterans who have served in the military. Joy Dockrey, a Saskatchewan Cree navy veteran who is from the Downtown Eastside, works with other Indigenous veterans in Vancouver. She explained that many people don’t understand why Nov. 8 is designated specifically for Indigenous veterans. “It comes with a very traumatic history that is separate from other veterans,” Dockrey said. Because they had to surrender their status, Indigenous veterans also weren’t entitled to the sam benefits as other veterans – such as financial assistance and healthcare — when they returned home. “When they came back they were twice traumatized,” Dockrey said. Dockrey said many Indigenous people continued to enlist because it was the only thing they knew, and they only place they felt comfortable and included. 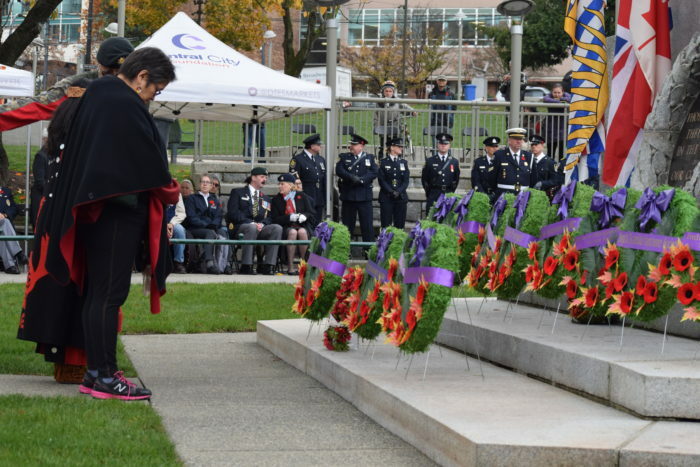 The annual National Aboriginal Veterans Day events in Vancouver are coordinated by Kelly White of Snuneymuxw. The day began with events at Main and Hastings before people marched to the cenotaph and concluded with a reception at Vancouver’s Indigenous friendship centre. Robert Nahanee, a veteran from Squamish Nation, served in the Canadian Forces from 1960 to 1974. He acknowledged about all the Indigenous warriors who have fought for freedom, from veterans to his own relatives who were in the Native Brotherhood of B.C. in the 1930s. “Our grandfathers were warriors for our rights and our inherent right to freedom,” he said.